World Health Day 2019 – how universal is our health coverage? World Health Day 2019 falls on Sunday April 7. The Slogan, Universal Health coverage everyone, everywhere, tends, in the popular imagination, to focus our attention on developing countries that have no health insurance, inadequate vaccination programmes and underdeveloped health systems and facilities. In contrast Australia has one of the best health systems in the world with universal free health coverage, the option of private insurance, a sophisticated and integrated two tier hospital system, access to scheduled and effective vaccination, world renowned research institutions and an integrated and timely emergency system. ‘The richness of our increasing diversity’ is evident in a visit to any hospital or health service, yet even a superficial look beneath the surface challenges us to greater inclusivity. The report on Australia’s health 2018 tells us that compared with 35-member countries of the Organisation for Economic Co-operation and Development (OECD), Australia scores in the middle or highest range for most health indicators. Conversely Australia ranked in the worst third of OECD countries for obesity, and our alcohol consumption is slightly above the OECD average. Not surprisingly obesity and alcohol consumption as well as other risk factors are highest in people who suffer socioeconomic disadvantage – Australia’s Health 2018 (AIHW). The 40% of Australians in the lower two socioeconomic quintiles – ten million people – are more prone to behavioural risk factors such as physical inactivity; alcohol consumption and smoking, and the biomedical risks of high cholesterol; high blood pressure and obesity. Lack of recognition of rights and needs, e.g., asylum seekers and refugees. It is within the scope of many of us to do something for at least one person. In Ephesians 4; 11 St Paul identified the apostles, the prophets, the evangelists, the pastors and teachers as necessary to equip God’s people for works of service. In Australia today could we add friends, neighbours, interpreters, readers, drivers, healers, pray-ers and advocates who can help make our health system ‘Universal for everyone, everywhere’ in Australia? 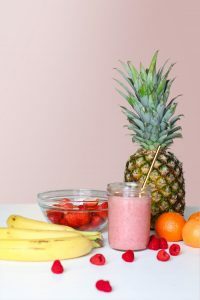 Strawberry juice beside fruits on top of table by Element5 Digital obtained on Unsplash. 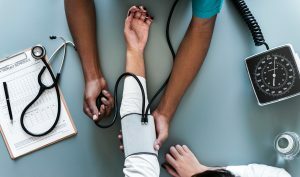 Person-using-black-blood-pressure-monitor obtained on Pexels. Used with permission.